For the area, see Mogadishu (area). Mogadishu is a Somali state at the Horn of Africa. It has a difficult start in 1444. 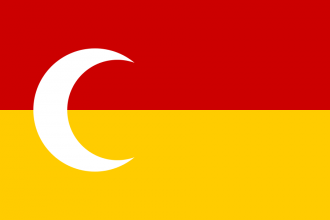 Mogadishu has very few options at the start, initial military victories can be wiped away by any of the large hostile neighbors like Kilwa, Ethiopia and eventually either the Mamluks or Ottomans. Even conquering all Somali lands gives you a bunch of poor, difficult to develop, provinces while being wedged in between powerful hostile nations. Therefor an exodus strategy might be the most viable. In most games Ajuuraan has some initial success, with or without Mogadishu's help. This means you can immediately get rid of your army, which gives you some ducats for advisers. You will want to prioritize DIP in order to gain the +115 colonial distance gained at level 7 before you get ADM's Exploration Idea's +50% colonial distance (this will give you additional range that will be crucial). You can either go South or East for a medium-difficulty exodus (Owning South-Africa or Indonesian islands will be good in the short run but will bring you into conflict with large nations soon. Because there are not many grasslands in these areas, you might struggle to develop, although trade will be pretty good, which will again attract attention from neighbors and colonizing powers. An easier exodus can be achieved by going for (South-Eastern) Australia where there is plenty of grasslands to develop and you are safely out of the way to develop and catch-up in tech before starting to expand downstream. Be careful to move your capital before a colonial nation spawns! Owning one half (not both!) of the Timor island will allow you to move your capital and have a nice naval base later. If going East, you might want to wait with colonizing until you can go straight to Hollavai (Diego Garcia), from there you can hop straight to Australia, preferably via West-Timor. Once you have built a new capital, you can choose to get rid of your Somali provinces, ally some local powers before you declare independence and then focus all your military on defending your new capital.